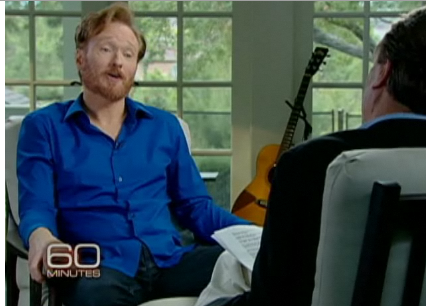 Former Tonight Show host Conan Obrien’s interview with Steve Kroft on 60 Minutes was was genuine and open in terms of what he said and how he said it. There were no contradictions. He was honest and forthright as his body language and facial expressions were congruent with everything he said. As he openly shared his feelings, we could visually see the impact of what losing the Tonight show in such an degrading manner did to him from an emotional standpoint. 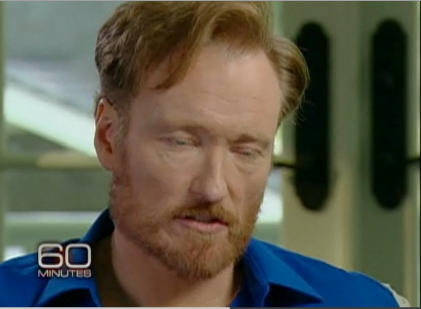 Conan was not ashamed to share that he was depressed after the turn of events. 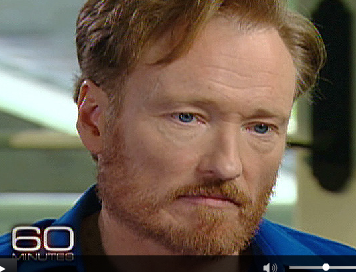 Then Conan revealed that he decided to go on tour – one of the things that was he was not prohibited from doing in his departing contract with NBC. He said that doing the tour was therapeutic and made him feel better immediately. As he spoke these words, you could actually see a visible and immediate transformation in his facial expression and body language. Both his facial muscles and body muscles suddenly became more relaxed . This was the first time during the interview that he looked like the old happy go lucky Conan O’Brien that we used to see each weeknight when he was the Tonight show host. What impressed the most in terms of what Conan said about his going on tour, was that he chose to not remain a victim of his bad situation. Instead, he became pro-active and did something about it . This made him feel better and helped him regain his self confidence and esteem. Having written a best selling book called “ Toxic People” over 15 years ago, my ears usually perk up whenever I hear anyone use the word TOXIC to describe a negative interaction with someone. So when Conan answered “ when it started getting toxic,” in response to Steve’s question as to when he decided to leave the Tonight Show, I was impressed as well. Once again it shows how Conan did not engage in a “victim mentality.” His leaving a “toxic” situation and not looking back, showed that he had and had enough self worth to not allow anyone to treat him so disrespectfully. It showed that he had the inner strength and the fortitude to “unplug” and walk away from the situation. 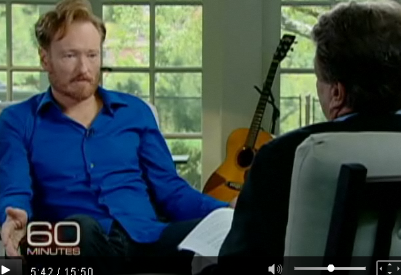 Throughout the interview Conan’s legs were apart , an appropriate masculine body language, which indicates openness. His posture was relaxed and arms were apart at the sides of the chair, thereby exposing his torso. When he would gesture, he would often expose the palms of his hands which also indicated an open stance with nothing to hide. This body language was consistent throughout the interview. As a true performer, Conan, acted out pulling the contract from his pocket and reading it which added to the humor and Steve’s laughter. Conan was one hundred percept honest and upfront throughout his interview until Steve brought up the topic of “getting screwed.” When that happened, there were multiple signals of deception that could be observed. He as clearly not telling the truth when he described what he says to fans who come up to him in gas stations and restaurants and say “Hey, you got screwed! But as Conan makes this statement , he is showing many signs of deception with his body language, facial language and the tone of his voice. In terms of his body language, we see a shoulder shrug which is a sure fire signal of deception. His head cocked to the side also indicates that he doesn’t’ t believe what he says. It also signals doubt, meaning he doubts that his fan is buying his “politically correct” rhetoric. Another interesting thing that happened when Conan said “ No I didn’t get screwed” was the sudden flash of anger across his face that followed . He then looked away. World renown facial language researcher, Dr. Paul Ekman of Stanford University, was the first to discuss the concept of facial leakage. This is where a sudden flash of emotion occurs, indicating a person’s true feeling a about a particular situation they are discussing In Conan’s case the flash of anger reflected his true feelings, even though his calm and measured words said the opposite . Leakage can not only occur facially, but can occur vocally as well, which my research in the area of voice analysis has shown. As Conan said “I’m fine,” there is an angry sounding edge to his tone. His tone reveals that he clearly knows he got” screwed: and he is NOT fine at all about it! But shortly afterwards, the laughter turns to anger. We notice that Conan’s body language begins to close off as does his voice. There is a creakiness at the end of his statement which indicates that his laughter and happiness was not genuine after all. Being a professional actor and performer Conan was indeed able to fool us for a moment or two. In fact his laughter was so engaging and contagious that Steve soon began to join in on the laughter. 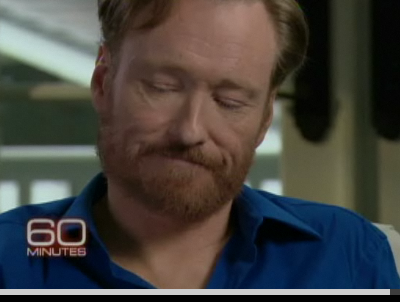 But the bulging vein in the middle of Conan’s forehead said it all. It clearly said that Conan was actually angry. His autonomic nervous system took over as his blood flow increased. 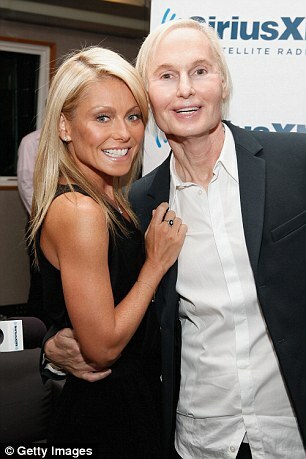 That is why you see the engorged vein suddenly appear on Conan’s forehead. 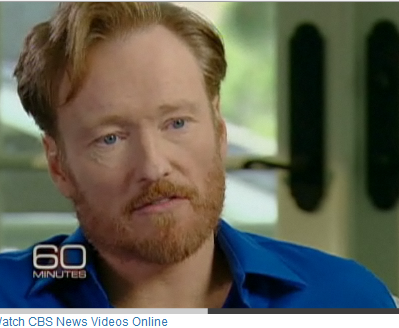 As soon as Conan says” Explain that to me,” he immediately flashes to an expression of seriousness and anger. With his serious expression, Conan is saying that this is no joking matter. 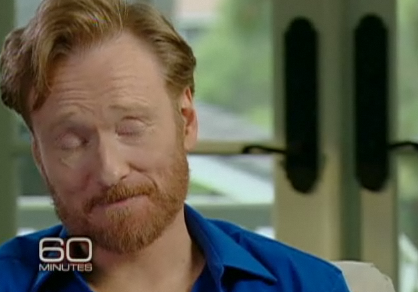 As he says these words, Conan looks up , indicating that he is attempting to visualize and then choose his words carefully . But what he says with his facial language, after speaking those these words says even more. His pursing down on his lips is a signal of anger . It says that Conan doesn’t expect to hear from Jay, and that he is angry about it. He is upset that his one time friend and comedic colleague has not yet reached out to him and will probably never do so. 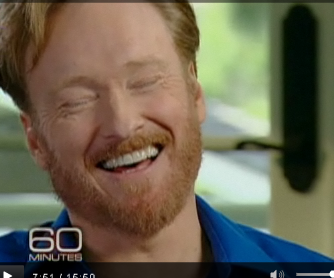 Steve then asks Conan if he thought Jay acted honorably. Conan looks down and inhales a huge breath of air. In doing so you can see his shoulders rising. This means that he is filling himself up with a reservoir lot of air in that he is gearing up for a lengthy communication about the topic. But then he loudly exhales the massive amount of air he previously inhaled. No doubt, he quickly realized that there is a contractual agreement in place and that he really can’t say all that he would like to say about the matter. He realizes that his communication on the topic will now be short and well thought out and within the confines of his agreement. That is why he replied with “ I don’t think I can answer that.” He is angry that he can’t say more as we see him looking down in anger once again pursing his lips. The lip pursing also indicates that he is holding himself back from making any disparaging remarks and saying what he really thinks about how Jay handled the situation. We also see a great deal of upset and pain in his facial expression as he is restricted from spilling out his true feelings. 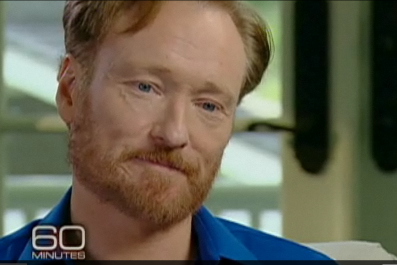 Conan continue to look down and we see him biting his lip. Lip biting often means that a person is holding back and and not saying what he really wants to say. Silence can be deafening as was the case when Conan bided his time to carefully measure his words and formulate a further response to Steve’s question concerning Jay’s honor. 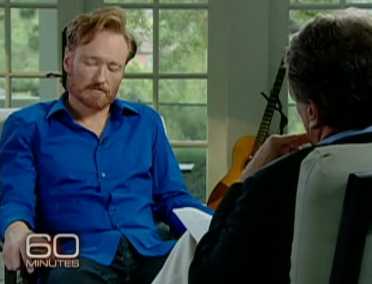 Conan eventully continues with “ I can tell you maybe how I would have handled it and I how would do it differently .” As he carefully speaks these words, he looks wide eyed and directly up at Steve Kroft. This indicates that Conan is once again ready to open communication-wise. He continues, If I handed the Tonight Show over to somebody and wished them well , I would to have done what was done.” As he says the words “ what was done, ” there is no doubt that Conn must have been visualizing what was actually done to him by Jay. You can suddenly see how this situation pains him as he furrows his forehead and brow and displays a scowl on his face. 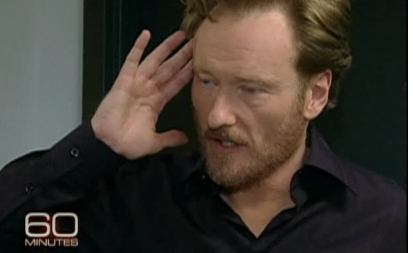 This is an expression of anger and disgust ,which uncontrollably leaked out over Conan’s face . The words he uttered were his attempt to show that he would have taken the high road and that Jay clearly did not do so. 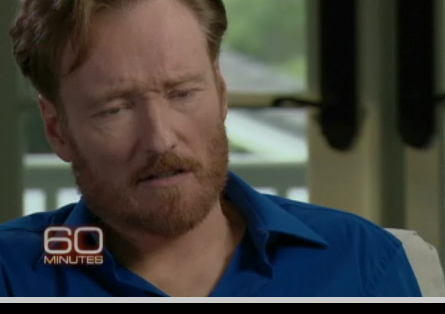 In reading Conan O Brien’s interview on 60 Minutes his body language, facial expression, tones, and what he says indicates that he is still very raw and feels very wounded . He let everyone know that what happened had a serious affect on him to the point that he became depressed. However, he wasn’t going to let his depression stop him, Instead he became pro-active, went on tour and as a result, now feels a lot better.